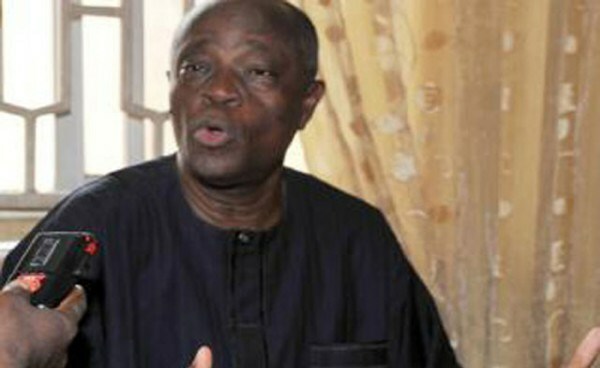 A chieftain of the Peoples Democratic Party, PDP, Adeseye Ogunlewe, has said that politics in Nigeria does not have room for the poor to participate in it. Mr. Ogunlewe stated this on Friday during an interview on Channels Television. He was responding to the speculation that the party delegates may be bought over with money by candidates contesting the forthcoming PDP national chairmanship election. Mr. Ogunlewe, a former senator and a former minister of works, is backing Bode George for the election. Mr. George has been the PDP deputy national chairman, South. “Oh, that is politics!” the former minister said when asked about the possibility of the candidates enticing the delegates with money to switch their support. “A poor person does not participate in politics,” he said. “A poor person has no business in politics. A poor man cannot win an election in Nigeria; how would you campaign? If you are poor, stay in your house,” he said again. Mr. Ogunlewe repeated the remark twice, which prompted his interviewer to ask him if he reckoned that the candidates would indeed buy over delegates. “No, no, no, they would not buy, but it is not going to be on empty hands,” the former minister responded. Mr. Ogunlewe explained why he was supporting Mr. George, saying the later had sacrificed a lot for the development of the party. “He had the opportunity he would have made himself a minister, but he gave it to me. And he has given it to six of us in Lagos state alone. “He had the opportunity of being an ambassador, but he refused. He also refused to be a gubernatorial aspirant,” Mr. Ogunlewe said of Mr. George. Mr. Ogunlewe said that Mr. George, in addition, had served at the PDP headquarters for 10 years, and therefore has the experience for the job. Mr. George’s candidature has been well-received across the country, he said. The former minister apart from dismissing the notion that young Nigerians should be encouraged to take over the leadership of the PDP, spoke against candidates in the South-west stepping down for one another, arguing that that would be against the spirit of democracy. The candidates should be encouraged to go out and test their popularity, he said. Other candidates for the PDP national chairman are a former governorship candidate of the PDP for Lagos state in 2015, Jimi Agbaje; a former governor of Ogun State, Gbenga Daniel; a former minister of education and a professor of political science, Tunde Adeniran; a former governor of Oyo State, Rashidi Ladoja; a media mogul, Raymond Dokpesi; and a former acting national chairman of the party, Uche Secondus.